Roller derby first began in Chicago, USA in 1935. Originally an endurance race, roller derby's popularity grew during the 1940s right through to the 1970s, gaining a reputation for being rough and aggressive Players and teams also developed famously intense rivalries. By the 80s, theatrical elements were devised similar to professional wrestling, and eventually, the public interest waned. However, classic roller derby never completely disappeared. A few teams remained active after the sport's decline, and some leagues formed to keep the traditional co-ed format alive. 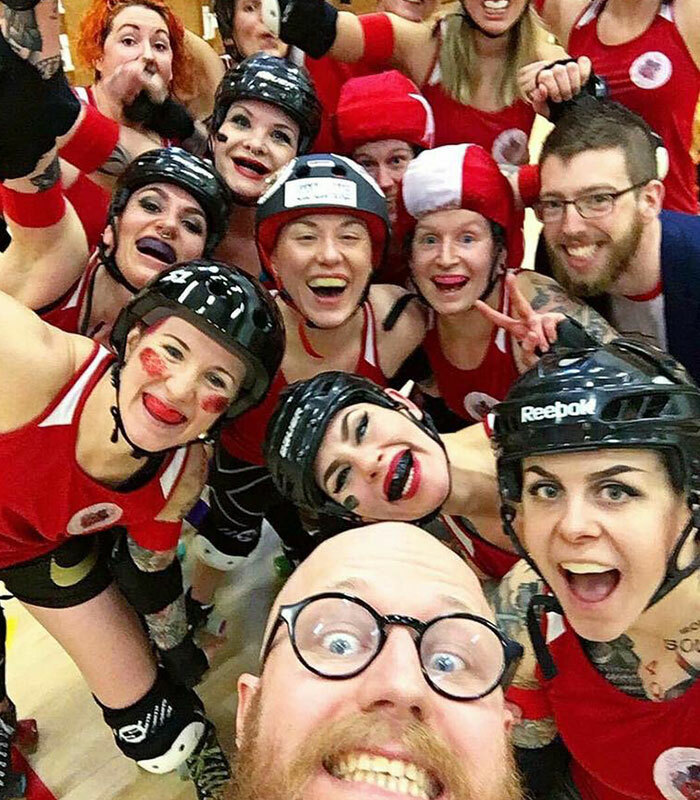 A recent, sudden explosion in roller derby's popularity has centred on new flat-track leagues. The first of these leagues formed in Austin, Texas in the early 2000s. Since then it seems a new league is forming every couple of weeks somewhere else in the world. Women's Flat Track Roller Derby is one of the fastest growing sports on the planet! There are 14 players per team, 5 of whom are on the oval-shaped track at any one time. On track, each team consists of a jammer and four blockers, one of which is called the pivot. The Jammer is the point scorer. This skater can be identified by the star on their helmet cover. The Pivot is the pacesetter for each team. This skater can be identified by the stripe on their helmet cover. The Blockers make up the rest of the pack. It's their job to help their jammer through the pack while simultaneously stopping the other team's jammer. Each game, or ’bout’ is made up of two 30 minute halves, made up of 2 periods called ‘jams’. The blockers skate in a counter-clockwise direction in a pack formation, with the jammers starting just behind them. It’s the job of the jammer to speed through the pack. Blockers use full contact hits (or ‘blocks’) to try and stop them. On their initial pass through, neither jammer scores any points, although the first to break through the pack is awarded ‘lead jammer’ status. On their second pass through, the jammers score a point for each blocker they pass without committing any penalties. The jammers can then lap the pack as many times as possible in 2 minutes, or until the lead jammer calls off the jam by placing their hands on their hips. The team with the most points at the end of the bout wins. Players who commit a penalty are sent to the 'box' for thirty seconds, leaving their teams short a player: a particular risk when that player is a jammer - a situation usually called a 'power jam'. There are over 35 pages of rules in the current rule set - check out the WFTDA site for more detailed information.